I’m so excited for today. I’m not a huge fan of giveaways and haven’t done many here, but this is one I’m really excited for. Downtown Tape did a shout-out looking for bloggers to help them get their new company off the ground and I jumped at the chance. They are a local Utah company that is selling washi tape for $1.99 a roll with a flat shipping fee ($2.95). I like their prices, I loved the product, and I want to share. Have you ever used washi tape? It is phenomenally popular in the craft blogger world. I decided I’d use it in a less traditional way and include it with food. 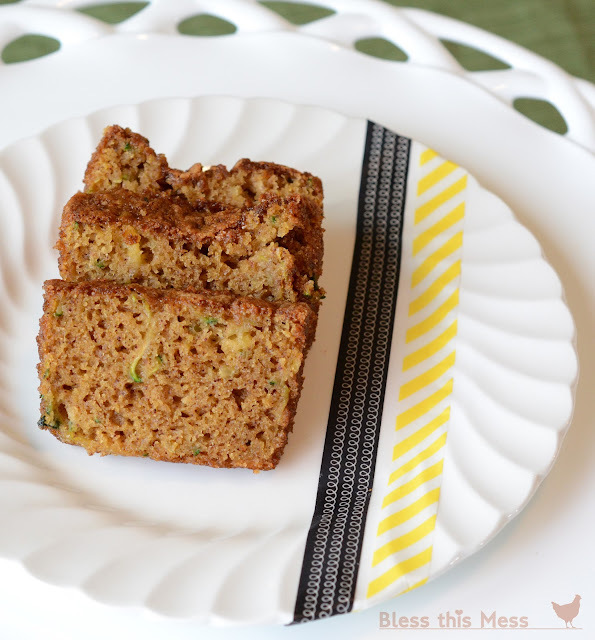 A recipe and a giveaway? Yes, please. The tape comes in all colors and patterns and feels like a thin masking tape. It isn’t as sticky as most tape and so it is very forgiving when it comes to using it. You can peel it up and re-stick it very easily if you put it on crooked. Downtown Tape is going to give away 10 rolls of washi tape plus 25 gift tags to decorate to a Bless This Mess reader! Just enter in the Rafflecopter gadget at the end of the post. Preheat the oven to 350 degrees. In a medium mixing bowl add the sugar, applesauce, oil, eggs, and vanilla. Stir to combine. Sprinkle the flour across the top of the wet ingredients and then sprinkle the baking soda, cinnamon, salt, and baking powder across the top of the flour. Stir everything together just until combined. 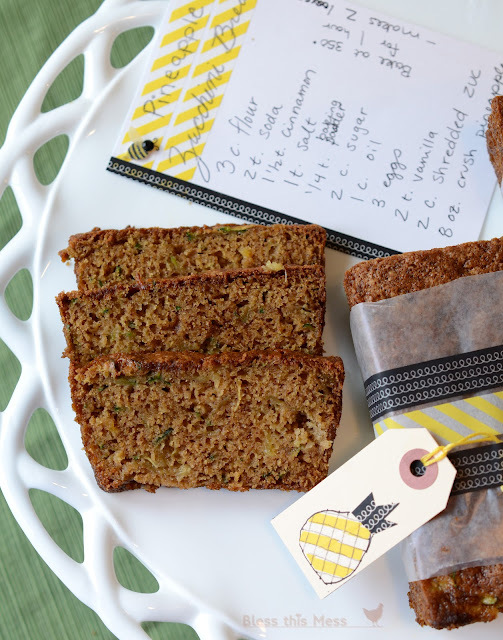 Add the zucchini and pineapple and stir to incorporate. Pour the batter into 2 greased bread pans and bake until the center is set and a toothpick inserted comes out clean, around 50 minutes to one hour. 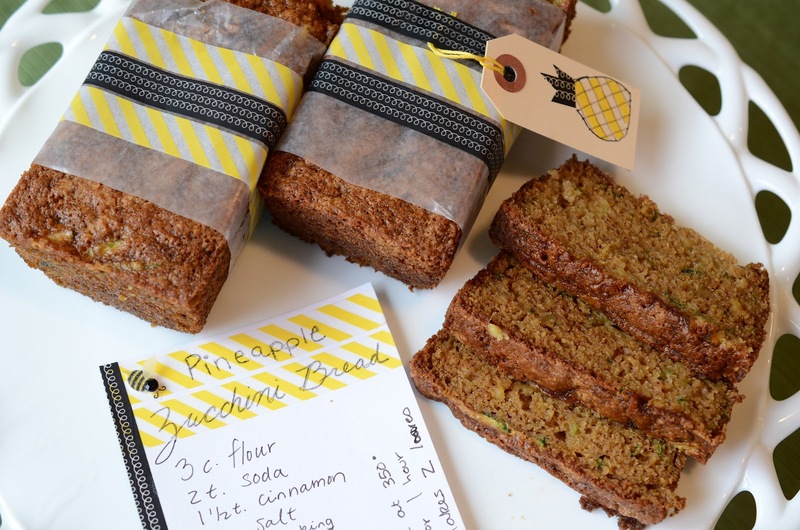 The pineapple adds a lot of sweetness and moisture to the bread. It is delicious! If the pineapple is not drained well or the zucchini left with all of its water then the bread will come out gummy. To get the extra moisture out of the zucchini place the shredded zucchini on top of two stacked paper towels and then press on it with two more stacked paper towels. You can sub the white flour for whole wheat (I did and loved it – still just as moist), just pump the baking powder up to 1/2 teaspoon if using whole wheat flour. I just wrapped a piece of wax paper around the bread and then wrapped washi tape around that (I tried parchment paper but the tape wouldn’t stick to it). I used some washi tape on an index card to share the recipe, and I even put some washi tape on my white dishes to add a little pop. The stuff peeled right off when I was done. Now, if you are new to Rafflecopter, don’t be nervous (Mom, this is for you). You just sign up with your email address and make a password, and they do the rest. I signed up a few months ago and have never received junk emails from them, so don’t worry. Then you press on the green buttons to enter. The more things you do, the more entries you get. The giveaway is only open to participants with a US mailing address. I wanted to let you know that if you do sign up for the Downtown Tape Newsletter (info on new designs, specials, sales…) then they’ll send you a free washi tag template as a little thank you. Not too shabby. There you have it. My first legit giveaway. I hope you all enter. I was so pumped about the tape that I have another post about it tomorrow. If this one didn’t convince you that you need it, then tomorrow’s will! Thanks for reading and good luck. Discloser: I was compensated for this post. Downtown Tape sent me a few rolls of tape to work with, and they are providing the prizes for the giveaway. The opinions in the post are mine and I wasn’t paid to say sunshiney things. I like the fancy tape or I wouldn’t have agreed to work with them in the first place. Bodabing-bodaboom. I’ve never used washi tape, but it’s be an easy way to dress up a jar or container to give away treats to friends and neighbors. I’ve never tried Washi tape. It looks like so much fun! I have used it a few times, but just as tape! I have never used it, but I sure want to! This would be great for those homemade gifts for Christmas! I’ve never used it but it looks so pretty! We always do homemade gifts for Christmas and I think using the washi tape is such a cute idea! You’re a genius. Trying to be more crafty! This looks like fun and you could use it so many ways! Okay, so I’m so not the crafty type (i wish!) but when you said this stuff is like masking tape, even i came up with a bunch of ideas of what to do with it. Cuz who can go wrong with masking tape? So I hope I win! I woud love to play washi tape. I’ve been eyeing it for a while. And those are great prices from Downtown Tape. Love how you used it! I’ve never used Washi tape, but I think it would work on baby shower invitations I am making! So cute! Would love to have something else to decorate with and this washi tape is all the rage these days! I LOVE rafflecopter! Its so easy to rack up points- just a click of a button! I was already signed in even. Soo, this tape. I’ve never seen it before, but it looks awesome! I think it would be fun to wrap presents w/ this as the tape (wrapping paper a brown paper bag or plain white or other plain colored paper. Also, it would be an easy way to decorate cards or a scrapbook page. no need to glue- much faster. 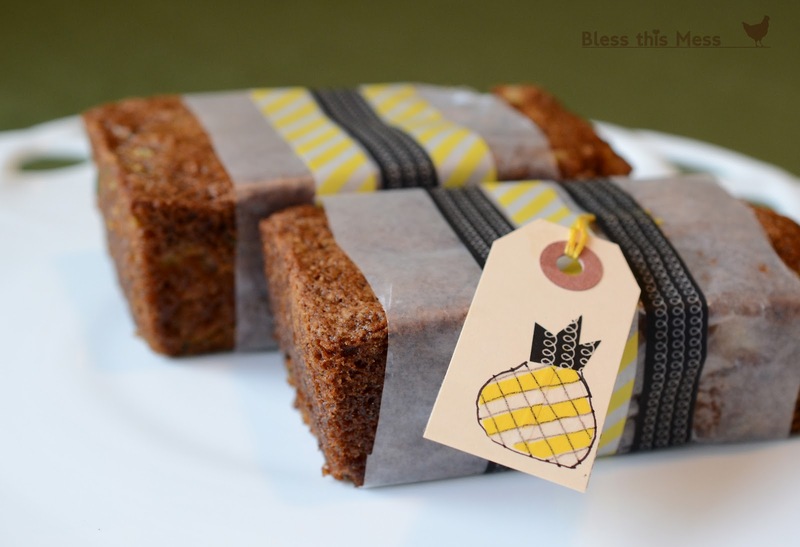 That tape is so cute, I would love it to make the baked goodies I give away look so much cuter! I haven’t used the tape, but I’ve wanted too for so long. I think it would be fun for decorating! 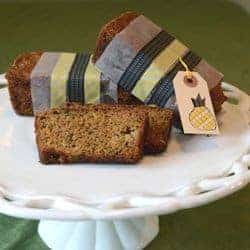 I’ve never actually used the tape, but I have thought of a million ways I could 🙂 I love your idea of using it to dress up the food gift!!! I’ve wondered about this tape for awhile now…thanks for explaining what it is. I think I might have to get some for my next crafty project! So fun Melissa! I’ve been wanting to get some washi tape. Love following your blog! MELISSA! You decorated food with it! Yuuuumy! And a recipe card?! I love it! Awesome! I’ll have to try that bread! I’ve never used it, but it looks really cute. 🙂 I’d use it for projects with the kiddos. They’d love it, I think. And if there was left-overs (or if I grabbed it first) I’d use the best for gifts for Christmas. So cute! I’ve never used washi tape, nor even heard of it before so your giveaway is sure helping them spread the word. I would use it to spruce up anything like you’ve done in this post and the next. I like the idea of adding it to mason jar lids and that way cute touch that it gives. I have to admit I had never even heard of it until I read your post… now I’m noticing it on Pintrest too! I think it sounds so easy… but yet it’s adorable. I’ve seen this but had no idea the creative ways to use washi tape. Fun!! I hope I win!! I have made polka dot picture frames out of washi tape and just two days ago I took out my glossy black jewelry boxes that looked marked from shipping and decorated them, looks so much better! I am wanting to use the tapes to decorate my handmade soap packaging and plain tags I have! I have so many ideas I’m wanting to try, love all the tapes! Turned out great, thank you!! !